We're always excited to leap into the open arms of a new season, and the transition from winter to spring is by far the most looked forward to. The shift from hearty roots to crisp, light-loving vegetables has us wanting to explore all the bounty that spring has to offer. And what better way to take advantage of those flavors than pairing them with simple pastas? 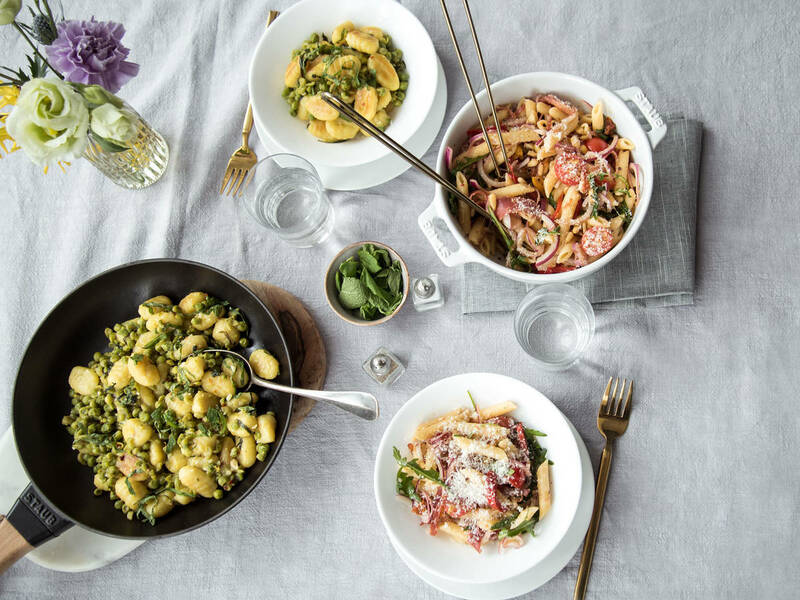 These 9 spring pasta dishes are ideally suited to a quick weeknight meal and will leave you feeling bright, ready to bask in the glow of budding trees, warm sunshine, and, most importantly, the freshest produce. Fresh cherry tomatoes sidle up to sweet, umami-packed sun-dried tomatoes in this breezy pasta salad inspired the Mediterranean. It's a real party in a bowl and makes for an excellent lunch or late-night snack straight out of the fridge. So cook up a big batch of this pasta salad¬ for eating throughout the week. When both fresh and fancy can be used to describe a dish, you know you have a winner. This penne with asparagus and smoked salmon is just that, and tastes as good, if not even better, than it looks. With a focus on crisp asparagus, zippy lemon, and herbaceous thyme and dill, the smoked salmon and goat cheese are just the cherries on top of an easy, spring-pleasing pasta. It doesn't get easier than this one-pot pasta with spinach and cherry tomatoes. Fresh herbs round out the flavors, and freshly grated Parmesan adds a salty richness. Make plenty, as you'll be inhaling this dish faster than the winter snow will melt. For a creamier take on spring, check out this spring pasta with peas, mint, and three cheeses. A little rich, a little tangy, and loaded with fresh peas, we like to categorize it as a comfort food tailored to the season of growth. Making the most of delicious tomatoes and ripe nectarines, this pasta dish is an ideal combination of sweet and savory. The macaroni could not be a better vehicle for the sauce, and the combination of the delicate shrimp and fruity tomato nectarine sauce can't be beat when looking ahead to springtime. It's never too late to take on a new years resolution, so make your own classic spinach and ricotta ravioli from scratch this spring. Serve the pasta pillows with roasted cherry tomatoes or your favorite light sauce. The slightly bitter taste of rapini, also known as broccoli rabe, is the leading flavor here, accompanied by the salty bite of capers and Parmesan cheese. Pair it with a glass of white wine and watch the spring sun set. A more positive outlook for the first warm evening of the season can hardly be found. One of our favorite ways to use fresh greens and herbs is to whip up an amazing pesto. This pasta verde uses an arugula and basil base, but you could sub in just about any fresh spring herbs and greens to harness your favorite flavors. A bit of Greek yogurt adds creaminess, but this could also be left out for a cleaner, herby bite. Peas, lemon, and fresh mint come together with hearty gnocchi, Parmesan cheese, and a kick of garlic and red chili flakes in this satisfying dish. While the recipe calls for frozen peas, when spring has finally arrived and pea-filled baskets can be found at the market-definitely make use of them here!